Your dream kitchen awaits. Whether you want a complete renovation or only a few remodeling changes for your current kitchen, certain considerations are necessary before the project begins. The most important may be your budget for the remodel. From cabinetry to sinks, prices vary. You may decide to spend less on one product to be able to spend more on another one. In addition to products, include labor costs in your calculations. Even a small budget, however, can support room-altering changes that improve how your kitchen looks and make it easier to use. Cabinet Genies can help you with every aspect of your kitchen remodel. Turn your ideas into reality with our products and services. Considering various options for your new kitchen will get you started. Kitchen interior design styles include Traditional, Transitional, Contemporary, Rustic, Cottage, Modern, Coastal, Old World, Industrial, Zen, Scandinavian, Chic, Country, Mediterranean and Shaker. Particular features define each style. 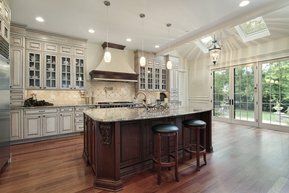 Traditional kitchens, for instance, feature natural wood, neutral colors and architectural details. Contemporary kitchens are open, sleek and technology-trendy. Whichever style you choose, ensure it fits your personality and how you work in the kitchen. It also should blend with the rest of your home’s interior design. A kitchen’s size affects the number of furnishings it can hold and sometimes the layout or placement of furnishings. Non-load-bearing walls can be removed to enlarge a small kitchen, but a small kitchen may be big enough as it is. For example, a galley-style kitchen contains basic furnishings in a small area, as does a single-wall kitchen. G-shaped, L-shaped and U-shaped layouts require more space. Their letters signify their furnishings’ arrangement. During a remodel, water pipes, electric wiring and gas lines often are not moved. Moving them to accommodate the relocation of a sink or oven increases the kitchen renovation cost. Create a layout after considering which furnishings your kitchen needs and then which ones you want to add. Islands are popular additions, and many kitchens feature a dining table. Your room should not have so many furnishings that they get in the way of you moving easily among them. They also should not prevent easy entry to and exit from the room. Choosing a color palette for your new kitchen will help you select furnishings and decor. Ensure your furnishing and decoration choices blend with each other beyond their hues, though. For example, a patterned countertop and patterned floor may clash. Kitchen cabinets, countertops, islands, sinks and appliances are made in many styles, including sizes. Most kitchens have standard-size furnishings, but larger or smaller versions are available or can be custom made. For example, cabinets can be shorter, taller or designed to function well for someone with a disability. Also, counter-depth refrigerators occupy less floor space than standard- or full-size models, making them ideal for small kitchens. Each kind of kitchen and bath countertop material has its advantages. The kinds of materials include granite, quartz, wood, laminate, glass, recycled glass, solid surface and metal. Counter colors and patterns are numerous. Some islands include a sink. Traditional counter sinks are single or double. Sink models vary in how they mount to a countertop, and you may prefer one’s appearance. Appliances are essential elements in kitchens, and some models are small enough to reside in drawers. They include miniature dishwashers and microwave ovens. Cooktop or range styles also have expanded, giving you more choices. Select furnishings that provide the look you want for your kitchen and that have features that suit your preferences. Vinyl, linoleum, tile, laminate, cork and carpet are among the kinds of kitchen flooring. Like other furnishings, each flooring type has advantages. When choosing a floor material, consider how comfortable you will be after standing on it at the cooktop or sink for a long period. Also compare flooring types’ durability, stain-resistance, ease of maintenance and ease of cleaning after something spills on them. Natural light from windows or skylights may be enough for you to see in the kitchen during daytime, but artificial lighting will be necessary between sunset and dawn. 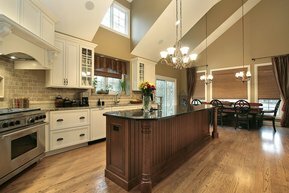 Overhead fixtures illuminate a wide area while fixtures under cupboards direct light onto counters and sometimes a cooktop. Besides being functional, fixtures can be decorative elements. Taking the time to plan and check can help your kitchen remodel succeed. Decide what you like about your current kitchen and which parts you want to change. Also decide which features to add or remove. Mark your desired layout plan on the kitchen floor with masking tape. Use precise measurements of furnishings to ensure the tape lines accurately represent your remodeling ideas. Revise furnishings’ sizes as needed for space limitations and walkway widths. Write down final measurements, and refer to them when you shop. Compare samples of countertops, flooring, paint and wallpaper to determine whether or not they look good together and with the kitchen cabinets, other furnishings and decor. Kitchen design has changed over the years and many homeowners seek to update their Kitchen cabinetry and design. The best thing about Kitchen Remodeling is being able to handpick the Kitchen Design and Kitchen Appliances yourself and make it the way you have always dreamed of. Whether you have Kitchen Remodeling ideas yourself or you have been searching online for tips and ideas, a kitchen design specialist can help you come up with a kitchen that looks great and functions perfectly. There are several kitchen design styles that will make your home look trendy and provide you with the ideal cooking space. A good contractor can remove and replace an old tub surround on the same day if the basic plumbing is still sound. The homeowner should choose a three wall surround if they have a popular alcove style tub and shower. A surround that locks at the corners can be installed quickly. For an added touch, change the fixtures. A homeowner who has a bit of money can install a shower room complete with computerized, cascading shower heads, jet sprays with adjustable water pressure and light shows. Tiles in both the floor and walls of these rooms can be made of porcelain, glittering metal, stone or colored glass. Shower rooms have niches for soap and towels and built-in seating. There are now several types of toilet bowls for homeowners whose old toilet bowls have begun to leak, have flushing problems or are simply boring. Some toilets come with a separate bowl and tank. Others come in one piece or are wall mounted. The caveat about wall-mounted toilets is that they need special plumbing and should be installed by a general contractor. Toilets even come with heated seats for those cold mornings and lids that open and shut via remote control. Some homeowners choose to hide the toilet bowl during a bathroom remodel. The toilet bowl is hidden behind an attractive dwarf wall or even in a lidded box made of sumptuous wood. A kitchen cabinet can be framed. This style is found in more traditional kitchens. Frameless cabinets are found in kitchens that are more contemporary. They can be made of engineered wood, MDF with a stainless steel veneer or MDF. The modern kitchen cabinet is fitted with accessories such as dumbwaiters and racks and bins to make accessing pots, pans and food items easier. Some homeowners spend huge amounts of time wondering what type of countertops to buy for their kitchen remodel. Among the materials found on counters and islands are engineered quartz, which is powdered quartz mixed with resin and pigment and formed into slabs. Other materials are natural stone such as granite. Granite, a tough volcanic rock, comes in many colors and is as beautiful as it is tough. Counters are also topped with slate or soapstone, laminate or solid surface, which has the advantage of having an integral sink. Concrete and stainless steel are also popular choices for counters. Even rock maple, an especially dense wood, is used. Contrary to rumor, wood does not encourage the growth of bacteria and is in fact somewhat antibacterial. This is good to know when renovating both the kitchen or bath. Along with counters, homeowners are paying more attention to the look of their backsplashes. These can be made of ceramic tile, glass tile or metal. Adding an island to a kitchen remodel can make the space more efficient. An island directs the flow of traffic and separates it from the work space, especially if it comes with a sink. Nowadays, islands have more than one level to make food prep easier. Most islands are made of the same material as countertops. 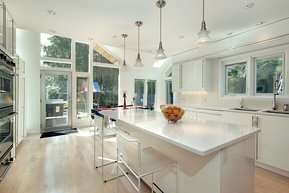 LEDs, or light-emitting diodes are becoming more and more popular in kitchen remodeling. Though expensive to buy, they pay for themselves quickly and can last for decades. They’re also cool to the touch, which is important in a home with young children. They are small enough to be placed beneath wall cabinets or toe kicks and bright enough to serve as general lighting when placed in ceiling lamps. There is probably a homeowner who renovates their kitchen just so they can have an excuse to buy new appliances. Brand new refrigerators, cooktops, dishwashers, ovens and stoves are not only good to look at, but are very energy efficient. Even if a homeowner isn’t planning to put their home on the market in the immediate future, kitchen remodeling or bathroom remodeling can be sources of joy.